A NEW FORM OF SPICES IN YOUR KITCHEN! The essential oil crystals are truly a revolution in Dutch kitchens. Through an advanced and patented technique the essential oil is encased in Crystals of organic agave. These crystals contain all flavors and active ingredients of the essential oil. The crystals contain no salt or sugar and are 100% organic and natural. The applications in the kitchen are endless. The crystals are both in cold and warm dishes and both in solid and liquid form to process. 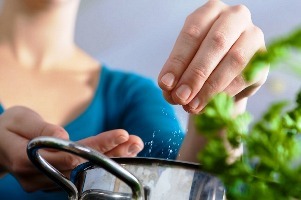 Sprinkle a pinch directly over your dishes, in the same way as a spice or a herb. The best result is obtained when the crystals are added at the end of the cooking process. Only a small amount is sufficient for the powerful aroma (1 jar contains approximately 400 servings). In each pack recipes are added. Not suitable for children from 0-6 years. OIL CRYSTALS ORIENTAL BLEND does not have any reviews yet. Share your experiences and post a review.